Farm-City Week is a celebration of production agriculture and the importance of the partnerships established between farmers and city-dwellers. 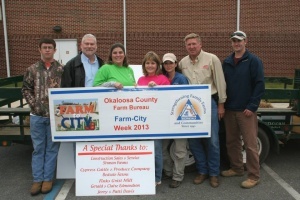 Okaloosa Farm Bureau celebrates the week with a town parade and food drive. The event is a collaboration of Farm Bureau and community volunteers, local farmers, and members from the USDA’s Natural Resources Conservation Service and the county Extension office. Last year, local farmers donated enough food to feed 150 families in need. Local media representatives were on hand to cover the entire community event. 921 W. James Lee Blvd.